The flavor of soups, sauces, and especially risottos depends heavily on the quality of the stock used. Bouillon cubes are terrible because they are usually more than 99% salt. Store-bought stocks usually also have a very high salt content, which renders them useless for sauces and risotto. And it is so easy to make your own stock, it only takes a bit of patience. From the comments of my readers and recipes on many other blogs, I’m starting to get the impression that many cooks out there believe there are only about four types of stock: vegetable stock, chicken stock, beef stock, and fish stock. However, stock can be made from virtually anything and each ingredient gives off a characteristic flavor. So you can also prepare lamb stock, shrimp stock, pork stock, rabbit stock, hare stock, pheasant stock, etc. If you make a lamb dish with a sauce or a lamb stew, you will get more lamb flavor if you use lamb stock rather than beef stock. So even though making duck stock is not different from making chicken stock (except that you use duck rather than chicken), I’m posting about it anyway to emphasize that duck stock exists, easy to make at home, and preferable to chicken stock in most cases for duck dishes. Unlike chickens, ducks are not often sold as whole birds. 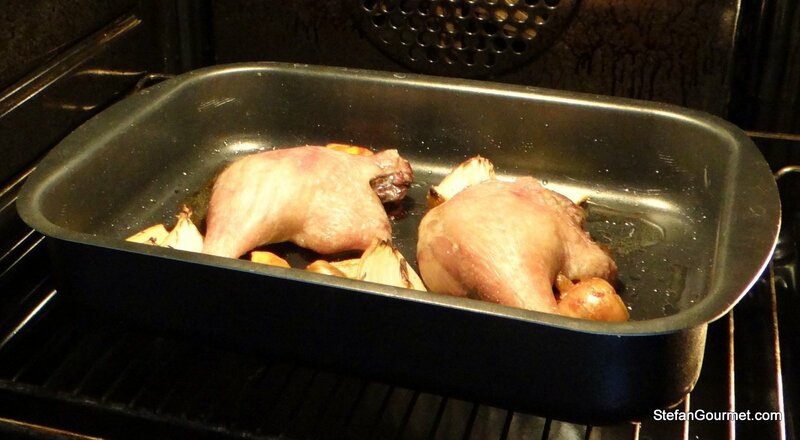 Since duck breasts are much more popular than duck legs, duck legs are available cheaply (at least in the Netherlands). 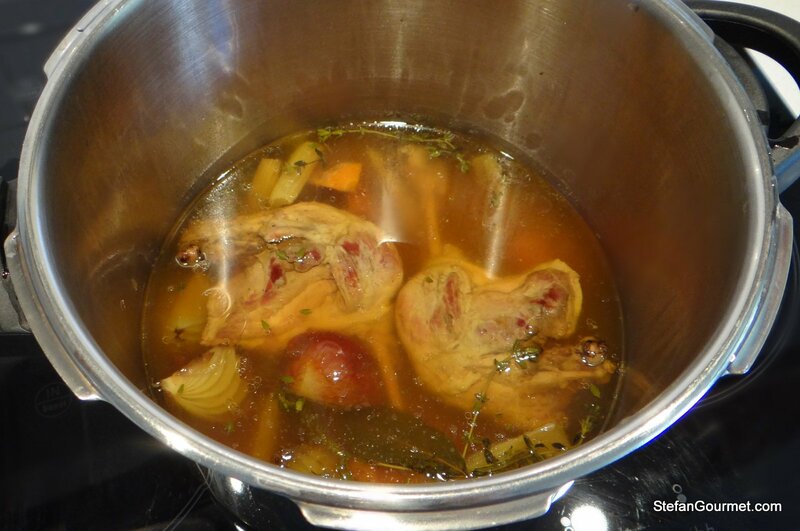 This is why I used duck legs for the stock, rather than the carcass of a whole duck. 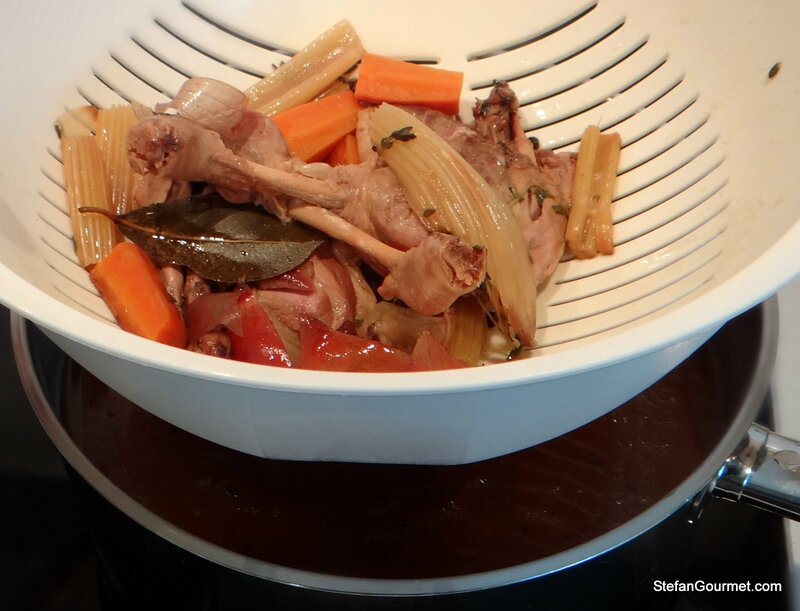 If you do use a whole duck, never throw away the carcass but always use it to make stock. Preheat the oven to 200ºC/390ºF. Combine the duck with the vegetables in a roasting pan. 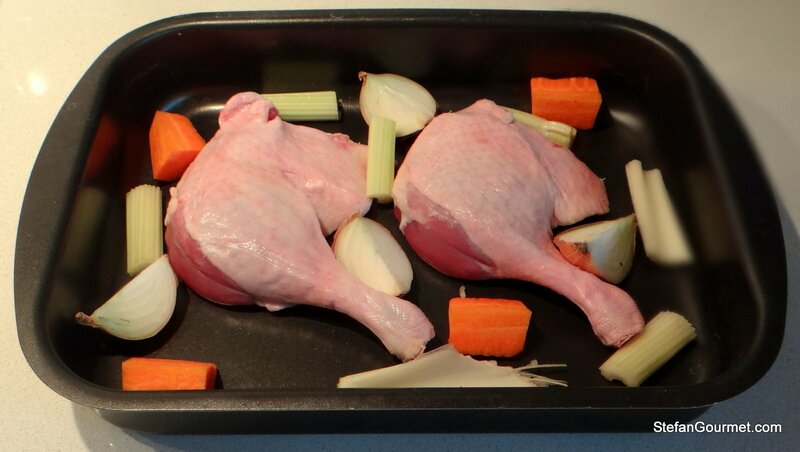 Roast the legs and veggies for 30 minutes at 200ºC/390ºF to get a nicely browned flavor. 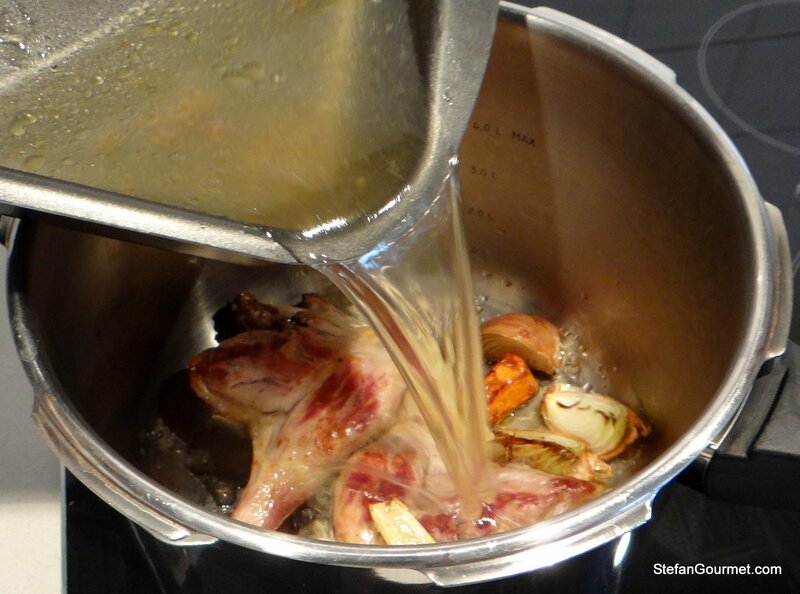 Transfer the contents of the roasting pan to a stock pot or pressure cooker, and deglaze the roasting pan with water. 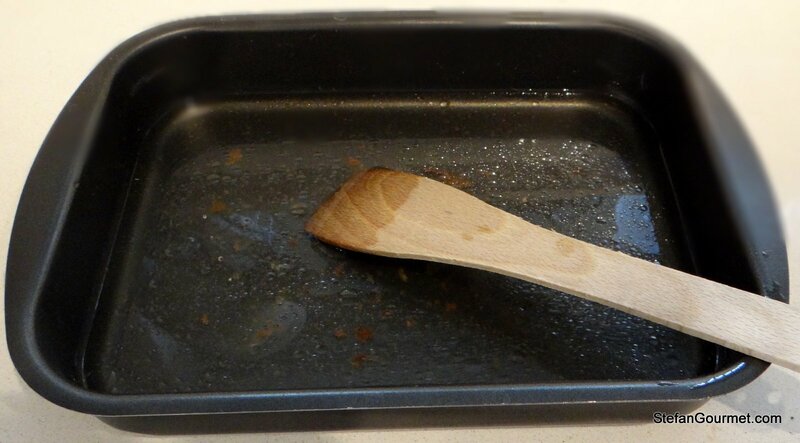 Use a wooden spatula to scrape all browned bits of the bottom of the roasting pan. 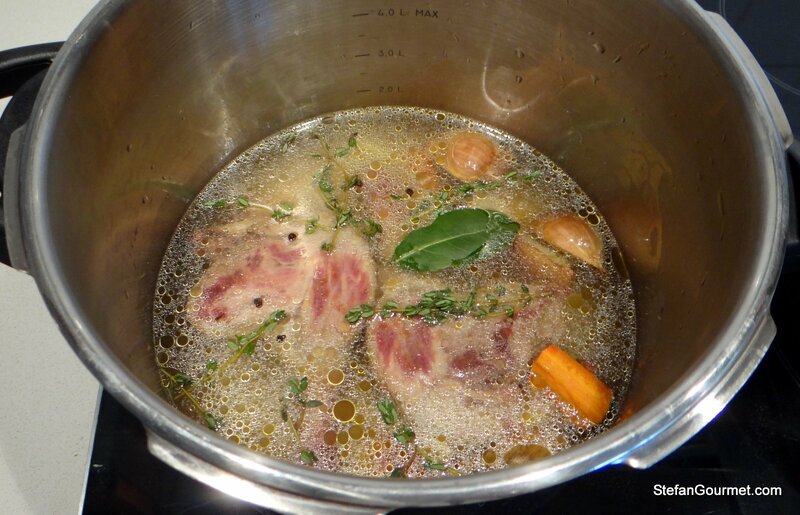 Add the water to the stock pot or pressure cooker. Add the bay leaf, pepper corns, and thyme to the stock pot or pressure cooker. 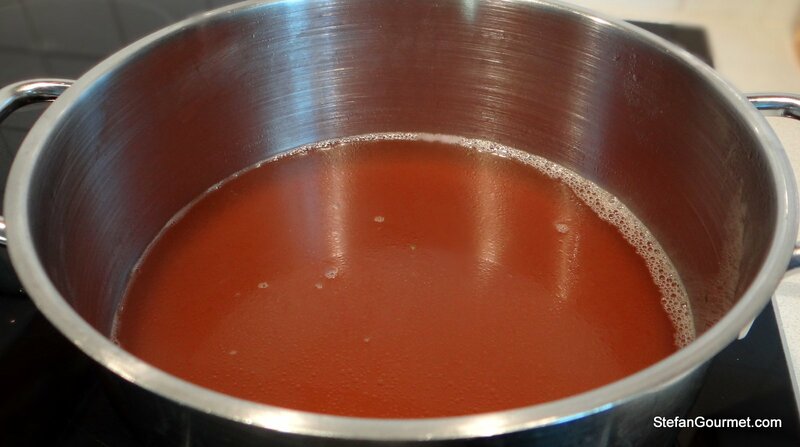 Bring to a boil and pressure cook for 1.5 hours or simmer in a regular stock pot for 3 hours. At the end of the cooking, first use a colander to remove the solids. 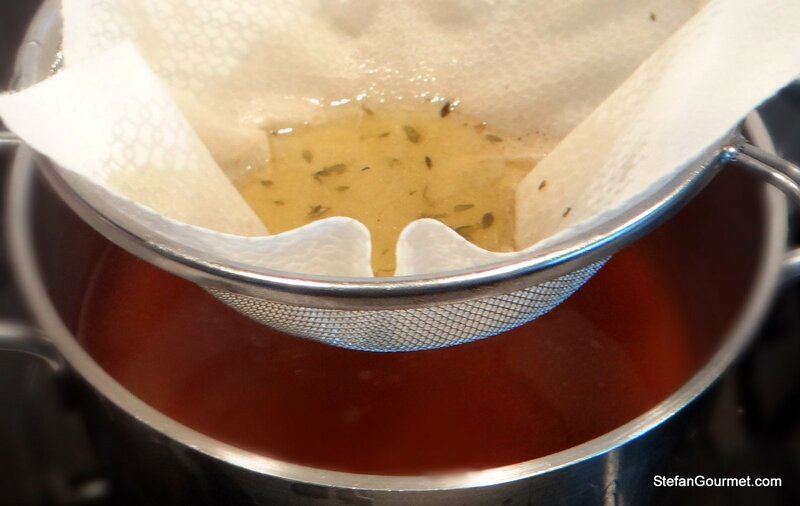 Then use a paper towel or cheese cloth to filter the stock and remove most of the fat. (To remove more of the fat, allow the stock to cool such that the fat will form a layer on top that you can remove easily). Use the duck stock straight away or quickly cool it to room temperature by submerging the pot in cold water and then refrigerate it for a few days or freeze it for months. Never add salt to stock before you have reduced it to the desired thickness. Lovely looking stock. I have only used duck bones before, never whole pieces. Does the meat retain any usable flavor at all? The point is to get all of the flavor from the meat into the stock, so if it does retain flavor you should cook it a little longer. When making stock, as a rule of thumb the bones are mostly for thickness (gelatin) and the meat is what flavors the stock. The meat does of course retain usable texture, so with spices you could still turn it into something nice. i can’t wait to see what you’re making next! Incredible..!! These duck legs are making me hungry. I will definitely prepare this stock at home. Thanks Lisa, great to hear. Let me know how you liked it. 🙂 Any Bartolini recipes for duck? Out of interest, what happens if you salt the liquid before reducing? The liquid will reduce while the salt will stay the same, making the liquid more salty. Since salt should in my opinion always be added to taste, it is very difficult to add the correct amount of salt before reducing. It may mean that you have to stop reducing before the liquid is thick enough, just because otherwise it would get too salty. Hope this helps. Thanks, I never knew this, but hate over-salted food, so that’s a really useful bit of information! Will try this. I will buy a whole duck or two a couple of times a month here in the Philippines (organic, too) and need to butcher the duck myself, so I’ve gotten a bit better now at knife skills. You don’t seem to indicate how much water to use, so I simply covered the duck carcass and vegetables. Added some parsley and half a crushed head of garlic at the last minute. If I remember, I will tell you how it came out. Hi Chris, when making stock it is always important not to use too much water. So barely covering is best.